The 2000s was a bizarre decade for culture. Britney Spears and Justin Timberlake were wearing head-to-toe denim at the AMAs, the invention of the iPod changed how people listened to music and the box office was dominated by “Avatar.” Because of the internet, this eclectic time in history has been thoroughly archived and preserved. One of the most common and accessible methods of documentation is YouTube, a video hosting platform initially seen as lowbrow compared to traditional industries like film and television. Popular videos from YouTube’s beginnings in 2005 were challenges like “chubby bunny” and the “cinnamon challenge,” or skits with offensive jokes and low production value. But over time, YouTube creators were able to use the platform to forge their careers as creators and entertainers. There are still residual formations surrounding YouTube and those on it — challenge videos are still popular and so are some of the platform’s earliest stars. 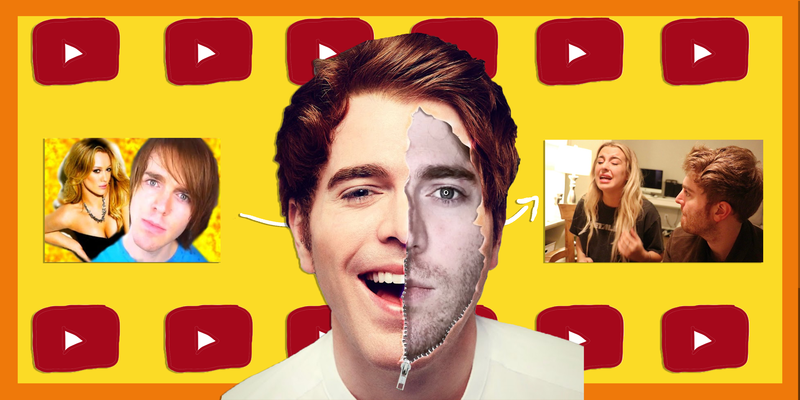 Shane Dawson is a creator who has demonstrated that with enough perseverance and an expert knowledge of the platform you’re working with, you just might be able to rise from lowbrow to high art. Shane Dawson, legally named Shane Lee Yaw, was born in Long Beach, California, to a poor family consisting of an abusive father, troubled older brother and mother. In the beginning of his YouTube career, many videos of his were mediocre skits of poor quality. Dawson’s creations were on par with most everyone else on YouTube — often filled with jokes that were either homophobic, racist, misogynistic, or relied on bodily functions for comedic effect. This style of comedy was popular in the early 2000s — from “40 Year Old Virgin,” “Borat” and “The Hangover,” among others — and it quickly translated into content on YouTube. In his video “Hillary Duff Pregnancy Game,” Dawson exhibits elements of what is considered lowbrow. The scandalous mention of the, then, young star’s pregnancy in the title is a very tabloidesque attention grabber that many people would feel compelled to click. The all-caps title is paired with a bright yellow thumbnail and a provocative picture of Hilary Duff — which were all very normal for the thumbnails that creators were choosing at that time. Back then, YouTube had no formal credibility in the media landscape and a creator would create an amalgamation of the brightest colours to catch the eye and then layer on provocative and out of context pictures with a comically outlandish title. The video itself would have nothing to do with the content it advertised — but it would deliver entertainment of a similar quality. The video starts with an ill-fitted frame and a slightly blurry visual of Dawson sitting in a room in his house. There’s no background, like channels nowadays that produce reviews or skits, nor any well-designed room like the now popular storytimes and beauty gurus. While also off-center, Dawson explains that this video will be of him opening his fan mail as one of his characters named Shanaynay. This character is portrayed by Dawson dressed up in an ill-fitting denim jacket, obvious fake pearl necklace, a bandana on his head that is tied into tangled hair extensions and the character’s signature poorly applied lipstick and over-arched eyebrow. Shanaynay is a character that is meant to portray people Dawson grew up with but in a comedically over done manner. She is prone to violence as a normal reaction, has a very crass intro (“hey gutter sluts and bubble butts,”) and is meant to be regarded as an individual with no class or formal education. Her character is a clear product of not only where Dawson grew up but of the times as well. Her jokes are now seen as offensive and her violent tendencies do not make you laugh so much as feel uncomfortable at what seems like a mockery of people who have grown up in unsafe areas. Not only was this type of humor popular then, but it was seen as mainstream. Racist and homophobic based jokes were just jokes, but over time, heightened self awareness and widespread understanding has diminished the comedic credibility of it. This slow but steady shift in society’s comedic taste was not lost to Dawson as demonstrated by his abrupt shift in style. The evolution of his content was integral to maintaining his relevancy and making content that can be seen as highbrow and respectable. On his essay about standardization and taste within popular music, German philosopher Theodor W. Adorno claimed that “every detail is substitutable; it serves its function only as a cog in a machine.” While the overall format was the same, the “cogs” would be switched out in order to slowly form more modern sounding works of art. Recently Dawson has made it clear that he wants to use his following and experience on YouTube to make more useful and personally relevant content for viewers. This is apparent in his documentary series on TanaCon, the first of a style that would eventually become a staple in his career. TanaCon was a convention from controversial YouTuber named Tana Mongeau that infamously failed. The situation sparked outrage across the medium and Dawson’s involvement with the convention was a perfect chance to establish a more sophisticated brand. Dawson’s recent videos are displayed with no green screen background, rather a clip from the actual video. Their titles are also properly formatted and both of these, while highbrow due to their mature presentation, show a type of quality that does not seem desperate for views. These videos are made by a creator with a strong enough following that there was no need for typical attempts at grabbing attention. The content provided within these videos are of much higher quality in viewing as well. Not only is there much more time and effort taken in editing but the tone that Dawson speaks to the camera with is one of seriousness and respect. He is himself the whole time, unlike his characters that made up the majority of his skits before. Dawson also takes himself seriously as an investigator — interviewing major players in the story as well as obtaining legal documents. Many fans are impressed by the added effort in Dawson’s new videos. While his previous videos seemed lowbrow and painfully simplistic in quality, they were akin to Adorno’s view on popular music at the time — simplistic in abstract meaning, but with a much scrappier execution. Dawson was the sole cameraman, editor and actor in all his scripted videos. Now Dawson has created a genre of YouTube content that can be seen as worthy of acclaim — each installment of his documentary style series is made up of unique parts and are incomplete without the rest — and require much more planning and people behind the scenes. Dawson’s evolution has proved that being high or lowbrow is not something a creator is locked into, and an expertise in the form can elevate one’s taste level. Header image by Cody Corrall, 14 East.